144 Cherry Lane, Clayton. Photo courtesy of Realtor.com. 380 Whispering Dl., Clarkesville. Photo courtesy of Realtor.com. 531 Clayton Ave., Clayton. Photo courtesy of Realtor.com. 355 Taylor Ridge Road, Dillard. Photo courtesy of Realtor.com. 185 Sylvan Lake Drive, Rabun Gap. Photo courtesy of Realtor.com. Looking to own some real estate in Rabun County or the surrounding area? Here are 5 local area houses for sale, ranging from $73,000 to $435,000, as featured on realtor.com. Search for these homes on realtor.com for more photos and a full list of features. 1. 144 Cherry Lane, Clayton ($1,995,000; pictured above) - Spacious and inviting home with room for expansion! From the gracious and flat parking area with 2-car carport, step inside the 2-story great room with vaulted ceilings, exposed beams, wood paneling and a massive stone fireplace! The kitchen, living and dining areas are open and perfect for entertaining. Walls of windows showcase beautiful westerly sunset and lake views while providing plenty of natural light. The large owner's suite with stone fireplace is gracious and private also with beautiful lake views. 2 additional bedrooms on the main and 2bedrooms upstairs lend themselves to lots of guests. Downstairs enjoy a spacious family/rec room complete with wet bar. Two large unfinished rooms on the lower level are awaiting your creative vision for expansion. 2. 531 Clayton Ave., Clayton ($149,900) - Very nice 3BR/3BA home close to Clayton. Located on corner lot with mountain view. This home is very spacious with plenty of storage and features 2BR/2BA on main level, and 1BR/1BA on lower level, open living/kitchen area with vaulted ceilings, hardwood floors, new carpet in bedrooms, 2 car tuck under garage, and two levels of porches. This property also has a 900sq ft unfinished apartment with 2 car garage and it is framed and stubbed with exterior finished. Very low maintenance yard, easy access and so much storage space. This home is in very good condition and move-in ready. Furnishings are mostly negotiable and wood stove is negotiable. Propane tank is leased and is used for the two back-up gas wall heaters. 3. 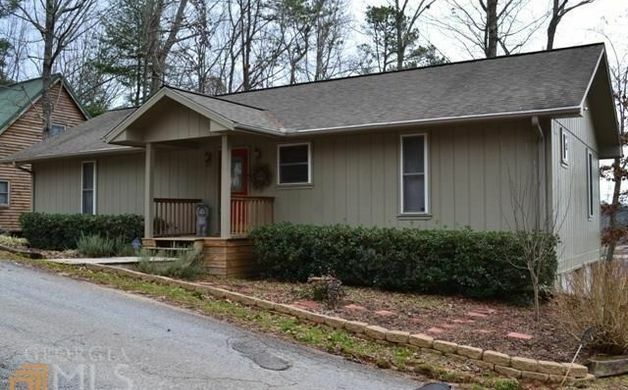 380 Whispering Dl., Clarkesville ($179,900) - Hillside bungalow with beautiful seasonal mountain views. 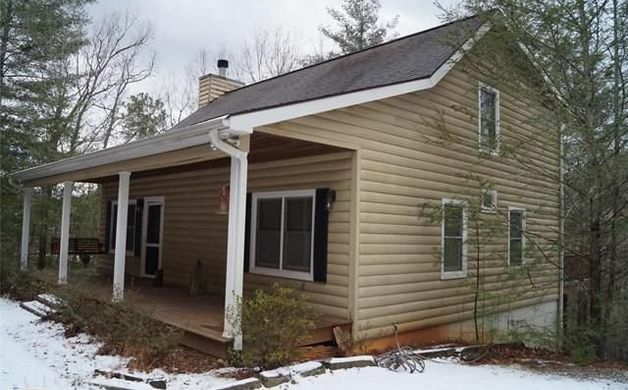 This 3BR/2BA home boasts extensive windows to let mother nature in and generous decks to enjoy the outdoors also, master on main with 2 additional bedrooms up and a partially finished basement with play room and a 1 car garage. Located in the coveted NE Georgia Mountains only 90 miles NE of Atlanta near the famous Glen Ella Springs B&B. 4. 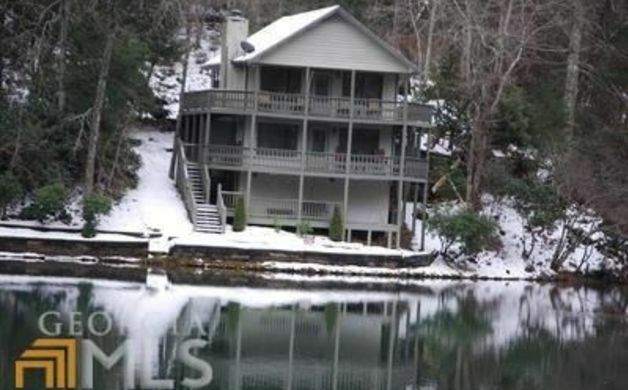 185 Sylvan Lake Drive, Rabun Gap ($229,900) - Lakefront home on Sylvan Lake. Comes Furnished. Well maintained home in wonderful community where water and road maintenance are provided. Adjacent to park/playground. Some mountain views. Very comfortable, very well maintained home. Both floors have wrap-around decks overlooking the lake. Ceiling fans, double SS sink w/disposal, dishwasher, refrigerator, washer,dryer, wooden blinds in windows. Laundry on main floor. 5. 355 Taylor Ridge Road, Dillard ($259,900) - Log sided home. 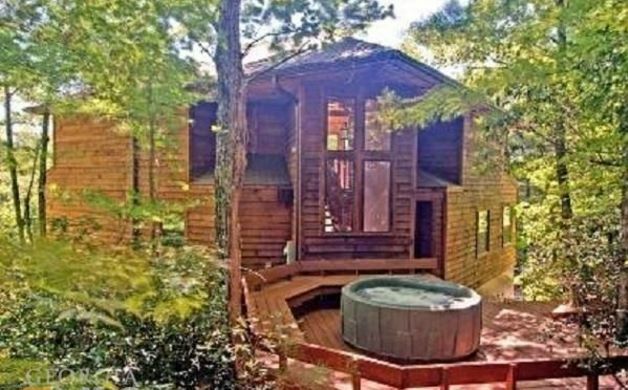 Very private on 3.3 acres of woods but convenient to town of Dillard. Pine floors, tongue & groove ceilings & walls, open great room & kitchen with double ovens, separate cook top, solid surface tops, Swedish design stack washer/dryer, rock gas fireplace, 2 bedrooms on main level with bath. Upper level loft is master bedroom & bath. Lower level offers wall to wall carpet with huge rec room "bunk room, another bedroom & bath, storage & access to outside. House has big front porch & 2 back decks. House is approved for a 3 bedroom septic.